This is a trick you can use to get more out of a standard double-sided laminating pouch, when you really only need to single-side laminate. It lets you essentially laminate two different pages, with just 1 pouch, doubling the number of pages you can laminate with a box of standard 2-side pouches. 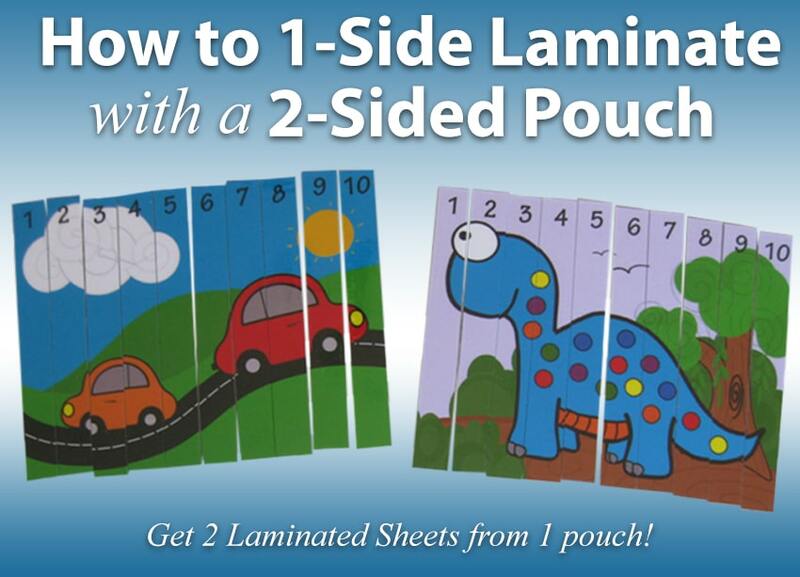 This laminating trick will cut your lamination costs in half, making it perfect for teachers who have to buy out of pocket, or even businesses with tighter budgets. 1. Turn on your laminator and let it warm up to the proper temperature for your laminating pouch. This will depend on your laminator, so you can check the user manual or guide for details. 2. Place your printed sheets back to back, and lined up straight, into the pouch and against the sealed edge. 3. Run the pouch through your laminator, sealed side first. 4. Once cooled a bit, trim the edges of the laminating pouch flush (or past) the edge of the pages. This will separate the two sides of the pouch, creating your two single-sided laminated sheets! TIP: If your pages are curled, just roll them the other way to help straighten them, rub them on the edge of a desk, or just place them under some heavy books. Fun, right? And smart when you really only need a 1-side lamination...no need to waste it when you can use it! Now you can double the amount of laminating you can get out of your standard box of laminate pouches. Do you use this trick? Tell me how! Email me at mallorym@buy101.com with how you use this trick in your life or work and I will feature you in our blog! Thanks so much for reading!